This piece was published (under a different headline) in the Sunday Times of India today. It marks the start of a column for them called The Rationalist. The other day, an internet troll sent me a love letter. “Why have you blocked me on Twitter?” he demanded to know. “You claim to believe in the freedom of expression. You are a hypocrite.” After that he said a few colourful things about my family. I think he wanted me to copulate with them. I am an absolutist when it comes to free speech, and this friendly troll was wrong. Indeed, I find that there is no concept as deeply misunderstood today as the right to free speech. These misunderstandings exist on all sides of the political spectrum. Thus, I find myself duty-bound to write this brief primer on the philosophical origins of free speech, to illustrate what I understand it to be. The earliest conception of individual rights came from the 17th century Enlightenment philosopher, John Locke. Locke held that the most fundamental right of all, the one from which all others emerged, was the right to self-ownership. After all, it is practically self-evident and beyond argument that, right from birth, all of us own ourselves. All individual rights arise out of this right to self-ownership. The right to life. The right to our thoughts, and thus to our speech. The right to our actions, which also results in the right to property. And so on. Freedom, another misunderstood term, means a condition in which these rights are not infringed. All of our rights are contingent to our respecting the corresponding rights (and thus, freedom) of others. My fist stops where your nose begins, as that old saying goes. Libertarians also call this the non-aggression principle, where aggression is defined as infringing someone’s rights. You may do anything as long as there is no coercion involved. By this reckoning, all voluntary interactions between consenting adults are kosher, as long as they do not infringe on anyone else’s rights. This holds true, as I often point out, whether those interactions happen in the marketplace or in the bedroom. Both the left and the right are thus incoherent when they support one kind of voluntary exchange but not the other. In accordance with the non-aggression principle, the core question I ask myself in any situation is: Where is the coercion? Looked at this way, many of the questions that keep getting raised about free speech answer themselves. Am I infringing on the rights of the troll I block? No, because there is no coercion involved. He is still free to say whatever he wants, but he is not entitled to my time and attention. Is a college within its rights to withdraw an invitation to a speaker? Yes, it’s their property, and the speaker can still express himself elsewhere. 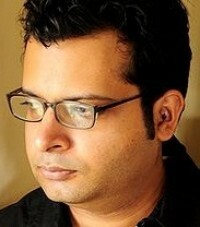 The Indian constitution, sadly, does not protect free speech. Article 19(2) lays out caveats such as “public order” and “decency and morality”, which are open to misinterpretation and, thus, misuse. This is a pity, but our democracy is a work in progress, and is made healthier by a free exchange of ideas. 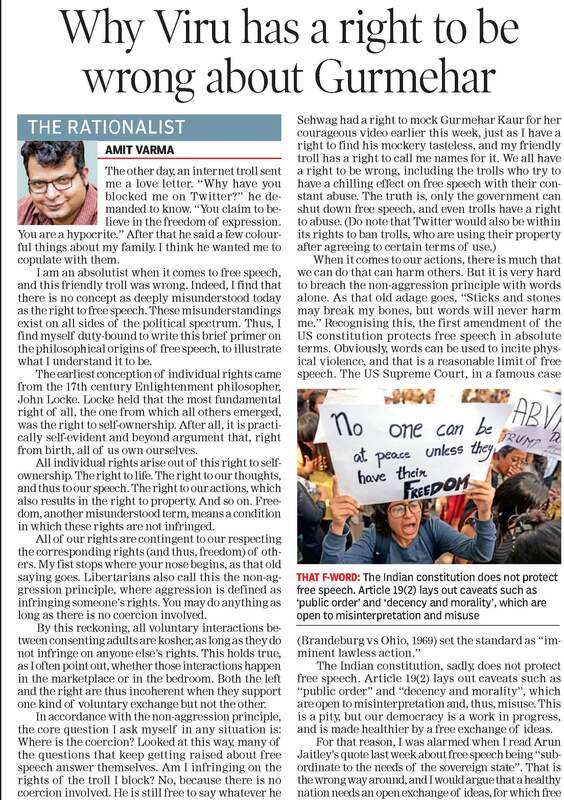 For that reason, I was alarmed when I read Arun Jaitley’s quote last week about free speech being “subordinate to the needs of the sovereign state”. That is the wrong way around, and I would argue that a healthy nation needs an open exchange of ideas, for which free speech is indispensable. That is why, if I were asked to compare Arun Jaitley and Umar Khalid, I would say that it is Jaitley who is anti-national, and a threat to our great republic.